We at Eagle Storage have a lot of experience with storage so call with your questions. Not all storage facilities are the same, there is a large range from storage in a old barn to full climate control. We have several options for you in both of our facilities in Hudson WI and Somerset WI. We have customers that drive to our facility because it is clean, easy and reasonable vs. the mini storage facilities in the larger cities around. 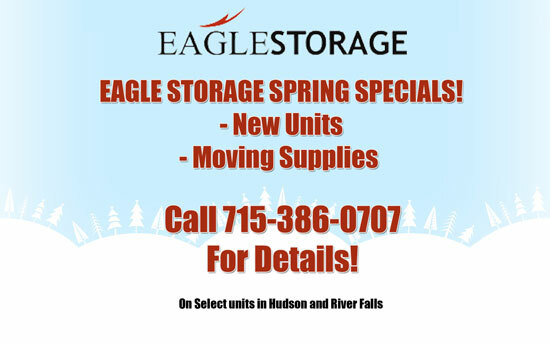 So if you are cleaning up the house, moving or just need the extra space call the storage experts at Eagle Storage. The owner operators are ready to help with your storage needs.